Since 2011 when i started coming to Amritapuri regularly I have found different areas in the ashram where i enjoy meditating. I discovered that the place that was the most powerful for me was the Kalari. Originally named Krishna Temple it is a small temple where Amma first started giving darshan and where back in the early days she would do Krishna Bhava and at times embody Kali through her dance. The Kalari has two rooms. The main room in the front is where the homas are held. When i first started going it was only open on the front side, where the entrance offered easy flow to the outside walk area. A full wall enclosed the room on the right side. On the left, a few feet back from the homa kunda (fire altar) there was a half wall. For some who arrived early to the homas these walls offered much appreciated support. They also helped hold and contain the space, enhancing a sense of intimacy with the ritual. During homas straw mats cover the tile floor. In relation to the ashram’s size today the Kalari is a very small space. The homa kunda made of bricks sits to the left of the small doorway that connects to the inner room where pujas are offered. This room is small and shaped like a rectangle stretching back from its entrance. A larger than life close up photograph of Amma as Devi is centered on the back wall and is visible from the walkway outside the Kalari. Long garlands of flowers hang over the frame. Homas and pujas are offered everyday at set times. How do we create sacred spaces? My favorite spot for sitting was against the wall on the pujari‘s left hand side. With my back supported I would watch him offer all the twigs, leaves, flower petals and ghee to the planets and deities, and was often captivated by the intricacy of the mudras dancing through his hands. The heat would build as the fire grew stronger and higher until the moment when the pujari would stand, his arms raised, his hands in front of his forehead holding two long, thin brass tubes with specially designed tips. With his hands pointing downward the liquid ghee contained in the brass holder was released into the fire which for a moment grew, expanded and then receded. I imagined a phoenix rising. Throughout the winter, spring and then part of the fall of 2013 i spent many hours sitting in this sacred space. 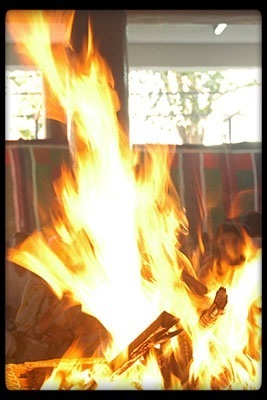 At five o’clock on some mornings, surrounded by women’s voices rising from the Kali temple next door as they chanted the morning archana (108 names of Amma and 1,000 names of the Divine Mother) i would sit leaning against the wall watching this fire ritual, and through the doorway to the inner room i periodically caught glimpses of a puja being offered. It was blissful. I would close my eyes and journey to deep far away spaces. In October, 2013, a group of ashram residents sat for a Maha Mrityunjaya homa being done for a friend who was recently diagnosed with liver cancer. The Kalari was packed, overflowing into the open walkway outside the main room. Shortly after the homa was underway the pujari instructed us to chant the Maha Mrityunjaya mantra continuously. A prayer to Lord Shiva for healing and overcoming death. We did this for the duration of the homa. I think it was one of the most powerful moments of my life. It was other worldly, as if we were lifted through the homa and the chanting of the mantra to another realm. At the end of the ritual i looked over at Prasida and she looked transformed. With tears in her eyes she seemed radiant. What touched me most was watching her openly receive the love and care that her friends were offering her, to see her vulnerability. As a nurse she had always been available to assist anyone who came to her for help at the ashram, she was one to give beyond limits, to be there for others any time, day or night. And now, she was open to receiving. From what i saw of her after that it seemed that she maintained this openness and vulnerability for the rest of her life. As if she were held in a state of Grace. I left the Ashram at the end of October to go back to California. Amma was on her Europe tour and then going on to the U.S. for a few weeks in November. I came back to Amritapuri in the middle of December. On a midmorning within a day or so of my return i went to sit in the Kalari. As usual i approached it from the side. When i got there and turned to go in i froze. I stood out on the walkway facing the homa kunda and didn’t know where i was. I could not find myself in the space before me. The walls on either side of the fire altar were no longer there. The wall that i, and countless others before and after me had leaned against over the years was gone. There was only open space. I didn’t recognize what i was looking at. This open space stretched around the sides of the inner temple which had plaster missing from its outer walls, and the dark brown wooden door was closed. This new area was large and roofless. I remember wondering what would people do during the monsoon season. How would we sit? The front of the Kalari was blocked off with plastic chairs. I stood there in shock. For the life of me i could not figure out what had happened. None of it seemed real. It was like a horrible dream. Eventually i turned and walked away. I felt devastated and wanted to find someone who could help me understand and make sense of what was going on. What i found out was that during Amma’s absence someone decided to remodel the Kalari. There are different versions to the story and i am offering the one i heard Amma tell during a Tuesday question and answer session. Apparently she gave instructions to fix the roof over the Kalari. Whoever was overseeing this task decided to do more, and the walls were taken down. Upon her return from the States Amma told them to stop. Within a short period of time the new space was completed. The open area was left roofless. The floor was painted red, and homas continued to be offered to the planets and deities. But for me the energy that was so embedded in the space and the walls of the Kalari was forever gone. The feeling of intimacy had been dispelled and scattered. I felt so sad for what to me, and others that i know in this community, was a huge loss. I felt angry and frustrated. How could someone do something like this? Was this not a sacred place? What were they thinking? Why was the community not informed and invited to participate, to be a part of this transition? I heard comments about the person in charge of this project. ‘Power’ and ‘control’ were some of the words that were used to describe and define. Why is a room, a place, held as sacred? What holds it, and how? Does it grow, build over time as the energy accumulates and penetrates the air, the walls? I wanted to understand how this could happen. And most of all i wanted to fully experience my loss. It was painful for me to hear “Well you shouldn’t be attached”, “just let it go”, “that’s how things are here”, “it’s karma”. Yes, i understand about impermanence and about attachment being a source of suffering. And i didn’t want to do a spiritual bypass. I wanted to feel, to connect with and hold my mourning with gentle care, empathy and understanding, and in so doing honor what the sacred enclosed space of the Kalari had offered me and to so many others. To mourn my unmet needs for care, inclusion, mattering. To be with. To allow. To do this with presence and awareness, and through this mourning release resistance and come to acceptance of what is. One day during the winter i decided to see what it would be like to sit for a 5:00 am homa, how it would feel to me. When i got there i found myself once again at a loss. I just did not know where to go, where to place myself. I put my cushion in one place and felt disoriented. I tried another spot and the same thing happened. Finally i sat up front on the left side of the pujari, close to where my usual spot would have been. I thought at least in this way it would be easier for me to let go of the open space behind me and sink into the ritual. I felt relieved to finally close my eyes and go to a peaceful place. Afterwards, while noticing my physical sense of unrest, i got the image of a dog wanting to make its bed to lie down. The way in which dogs turn around in tight circles, first one way and then the other as they paw the ground, wanting to nest. That was me. I went back one more time and have not returned since. It just has not called to me. I meditate in my room and over time, through sitting with all kinds of bird, construction, traffic and people noises in the background my practice has gotten stronger and more consistent. The day before yesterday at breakfast my friend Nandini said “They inaugurated the new meditation room this morning.” I looked at her blankly, “Meditation room?” “Yes in Amma’s house. Amma’s sister did a puja.” “Amma’s house?” I still had no idea what she was talking about. In my mind i saw where Amma lives today and this made no sense to me at all. “Yes, Amma’s house, the one she was born in and where she grew up.” I think we went back and forth with this at least two more times because i couldn’t grasp it. It turns out that the rooms next to the Kalari, and where the Matruvani monthly magazine was printed and put together for years, had once been the house where Amma was born and raised. As i write this i am still stunned. After breakfast i wandered over to the new meditation room. I stood in front of the doorway looking into a small room. Centered on the far wall there is a large black and white photograph of Amma meditating when she was young. It took my breath away. It is framed by a dark wood structure reminiscent of a temple which also holds the altar. The proportions are exquisite in relation to Amma’s picture and the room as a whole. Photos of Amma framed by long strips of polished dark wood flow together to line the top of the walls all around the rooms, like a frieze. Straw mats are spread out wall to wall. The altar and the area in front of it were covered in flower petals. The remaining offerings of a puja. A very tall brass oil lamp with burning wicks stood in front of the altar. The room is small and feels cozy, comforting. I felt myself being drawn into this space as if by a magnet. I was aware of a quiet peacefulness settling inside of me, of my body relaxing, a gentleness in my being. I slipped out of my sandals and walked through the doorway. With barely a thought about where to sit, i gently, with open heart got on my knees bowing in gratitude. Nearby i heard the sound of a bell ringing in the Kalari. I recognized an old friend. I sat, closed my eyes and welcomed myself home. After i left the meditation room memories of last year and the Kalari came back to me. I hadn’t really thought about this in a while. I realized there was a piece that was important for me to address in order to have closure. I am committed to a practice of Nonviolent Communication (NVC). I long to live in this consciousness, one of presence, empathy and mindfulness. I am aware of the judgments and labeling that i have carried about the person who made the decision to remodel the Kalari. I want my heart to be open when i think of him. NVC assumes that every action we do is an attempt to meet one or more needs such as compassion, care, understanding, empathy, love… and that these needs are shared by all of us regardless of race, gender, age, culture. Over these last couple of days i have been wondering what needs this person might have attempted to meet by his actions. Clearly his strategy did not meet my needs for inclusion, consideration and mattering. Once again i am reminded of how important it is to hold with care the needs of others when choosing strategies to meet my own. In the end the outcome on the physical plane may not meet everybody’s needs, but when we experience being held with care and that we matter, then the emotional and interpersonal outcome can transform and support individuals as well as communities. I choose to imagine that this person wanted to contribute, and that by opening up and making the space around the homa kunda wider, as it was back in the old days, he could see how it would make it possible for more people to attend the homas. I know that when i think of this person in this way my heart opens. I want to imagine scenarios that hold others with loving kindness, that nurture the sacred places within me. I know about the other stories, the ones with judgments and blame. I have been telling them to myself and participating in them my whole life. It is a habit. This is how i, and the majority of people in Western culture have been raised and programmed. I find being in these stories painful, they close my heart. I am committed, to the best of my ability, to choosing stories that open my heart and enrich life. What creates sacredness in a room, a tree, a mountain, a lake, a river, a rock, a leaf…? Is it intention, devotion, grace, respect, honoring, presence, worshipping the divine …? Is it about what the place or object means to us, and what we tell ourselves about it? Is it about how we leave a part of ourselves, our heart, in this place or object? Such a powerful piece. Thank you for sharing your process. Did you go into the room that is on the left when you enter the new meditation area? The shakti in that room was SO strong, at least for me. I am not one who meditates, but I think even I could learn to meditate in that room. No i haven’t yet made it past the first room. 🙂 I sense that i will be spending a lot of time in those rooms!